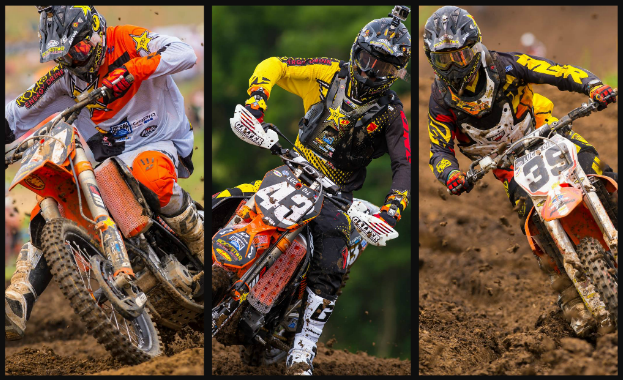 The entire Rockstar Energy Racing Squad would like to act as if Muddy Creek 2014 never happened. If it wasn't one thing it was another and the bad luck bug struck every rider on the team at least once. Jason Anderson was coming off a high with his first podium of the outdoor season in Mt. Morris prior to the break. He was also looking forward to the time off to work on some things and also get 100% healthy. Anderson's momentum did not carry over however as he struggled all day. His times were a bit off in qualifying practice compared to his usual standard and the day just followed in that suit. He did get a good jump out of the gate in moto 1, but unfortunately about 3/4 of the way through the first lap, he was involved in an incident. Marvin Musquin made a mistake, swapping into Jason and taking him down with another rider as well. This put him well in back of the pack. The best part of his day was certainly coming all the way up to 9th place. He was in a similar position in moto 2 when he went down in the same exact location as before, this time all by himself. When he remounted his KTM and took off, he did not notice the banners wrapped in his rear wheel. They were so entangled that he could not continue and was forced to DNF. Jason Anderson: "Bad day. Things really just didn't go my way. This isn't my best track anyway, but things simply did not go well. Need to regroup and focus on Redbud. I like that track and I ride good there." Joey Savatgy had a similar day to his teammate. The difference being that he had his best qualifying result of the season inside the top ten. In the first moto, he had a good start, but went down in turn 1 like so many others on the day. He got back on his bike and began his own trek from the back. He was able to get as high as 15th place by moto's end. In the 2nd moto his start wasn't as good, but he made it through the first corner unscathed. He made a couple mistakes but still finished 11th, his best moto result of the season. One thing about coming back from a long layoff is that first the speed returns, but it's usually accompanied by mistakes. You have to get comfortable with that pace again and it's tough on the most rutted and technical track of the year, which was certainly the case at Muddy Creek. Joey Savatgy: "Day was terrible, that's it. 1st moto, good start, slid out in the first turn, came back to 15th. 2nd moto, decent start, and just didn't have a good race. I don't even know where I ended up." Finally in yet another carbon copy of the day was Ryan Sipes' experience. Ryan had a great first moto going. He was trucking along inside the top 10 and making ground on the riders in front of him. It was only his 2nd national of the year, but he was keeping James Stewart at bay. He looked to be headed for a sure top ten barring any adverse happenings. That was until Stewart made a questionable pass in a very high speed section. The result sent Sipes cartwheeling down the hill in dramatic fashion. Luckily he was not injured too severely, but his bike however was. In the 2nd moto, he had another form of mechanical issue that was a residual from the incident with Stewart. He can at least however take a positive from how good he was riding. Ryan Sipes: "Muddy Creek was a tough day. I felt great, thought I was riding good and my bike was better this weekend. I was running about 8th in the first moto and catching Brayton. I didn't even know Stewart was behind me. I guess he was there for a couple laps. I don't really know what happened. I know my line was from the outside cutting in. All of a sudden I had a yellow bike in the side of me and I flipped. My hand got in the spokes or something and it hurt. I got up and tried to ride but my bike was real tweaked. 2nd moto, I felt good again, had a decent start and then my grip started to spin. Apparently that happened in the first moto and we didn't realize it. It was almost coming all the way off! It was just kind of a tough day. I guess it happens." The next race is typically the highest attended outdoor race of the season, held at Redbud Track and Trail during the 4th of July Holiday. Anderson who has always been fast there will try to get back on the podium. Savatgy will focus on being more comfortable and get inside the top ten. Sipes was already riding well, he just needs some luck to come his way.